Brief announcement was made in this paper last week of the death of Miss Mayme Spinner, which took place late Tuesday night, July 25, 1933 at the home of her nephew, Tade Spinner, near Waterville. The remains were brought at once to the Saam undertaking parlor, from whence they were taken to the home of her brother, Peter, on River Street, and held until the funeral Friday morning. During this time a host of friends from far and near, both from city and country, came to pay their last tribute of respect to this estimable woman. 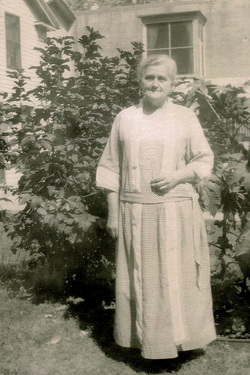 Mary Katharina Spinner was born at Village Creek, Iowa, June 5, 1864, and died as above stated, being aged 69 years, 1 month and 20 days at the time of her passing. She was the daughter of Mr. and Mrs. Peter Spinner, Village Creek pioneers, the father dying Dec. 18, 1890 and the mother August 5, 1914. One brother, Carl, the former popular Waterville merchant, and a sister, Katherine, who died in infancy, also preceded her to the grave. Surviving to mourn her loss are her five brothers, Frank, Fred, Peter, William and Con, all of this city, and their families; besides a host of other relatives and friends. Deceased came with her mother to Lansing to live in April, 1902, and resided here until about three years ago, when on the death of her nephew Tade’s wife, near Waterville, she went there to keep house for him and be a mother to his children. Many years previous, with her mother, she took Carl, Jr., and raised and educated him; and during all the ensuing years she was always helping the brothers with their families, and naturally was a favorite aunt of her many nieces and nephews. Her life was indeed one of service to others, and for many years she was a member of I. C. church choir. Being all her life a devout and true Catholic, she died fortified by the last rites of the church, and although her passing is mourned by many, they are sure of her being numbered among the blessed in the mansions of the Master in heaven. Funeral services were held at I. C. church in Lansing last Friday, Msgr. G.L. Haxmeier singing Requiem Mass at 9 o’clock and officiating at the graveside in Gethsemane cemetery, where interment was made in the family lot. Casket bearers were six of her nephews, one from each of the families of her brothers, as follows: :Tade, Clarence, Kenneth, Vincent, Norbert and John Peter Spinner. Among those from out of town in attendance at the funeral were Mr. and Mrs. Carl Erickson, Mrs. Miriam Rosecrans. Misses Mildred and Florence Spinner, all of Minneapolis; Mrs. Mary Larson, Mr. Jennings, Ossian; James E. McGeough family, Tom and Miss Lou McGeough, Mrs. Mamie Urell, Mr. and Mrs. Ed Ryan, all of Waukon; besides many old friends from Waterville, Cherry Mound, Paint Rock and Wexford parishes.